If you are thinking about installing hardwood in your home but aren’t yet sure, you may benefit from installing wood-look tile instead. You may have heard of the benefits from hardwood floors, but how do these compare to the benefits from wood-look tile? Does one win out over the other? Read on to find out! The first area we will look at is the cosmetic benefits. High quality hardwood can add a warm feel to the entire room, but most wood-look tile is indistinguishable from wood to the naked eye. Digital scanning and printing have come so far that they can mimic wood grain exactly. The pattern printed on the tile mimics a large number of different planks so that the floor further mimics hardwood. 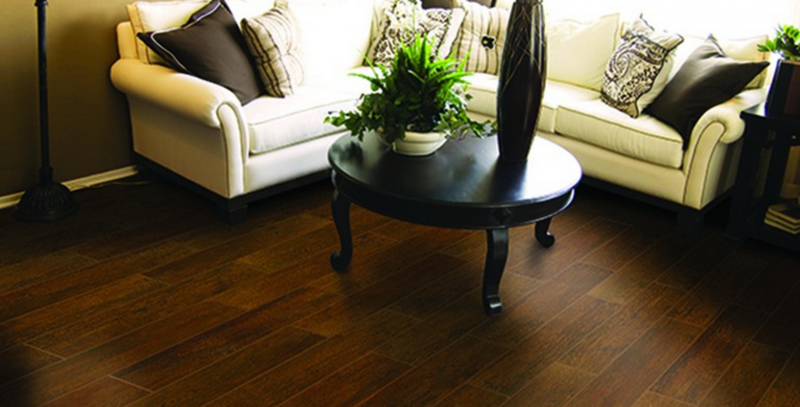 So both hardwood and wood-look tile will give you the desired look. So what about the practical benefits? Hardwood is durable and strong. That floor will be able to hold up to high traffic areas and endure almost anything you put it through. Can wood-look tile compete with this? Porcelain tile is made of clay compressed under great weight and then fired at high temperatures. It is nearly impervious to marks, scratches and cracks. Hardwood can actually scratch very easily, and may dent or crack from rough use. On top of this, wood floors should not be installed in humid or often wet environments, including bathrooms, kitchens, mudrooms, and laundry rooms. Wood-look tile? The clear winner here, since it can be placed anywhere you like! You may have heard that wood floors are great for those who suffer from allergies, whether from pets, pollen, dust or all of the above. Wood floors do foster healthy indoor air quality, but here we have a tie. Both surfaces are great for battling the sneezing season. Both wood-look tile and wood floors are easier to clean than some other floor surfaces. A quick dry mop over the floor should do the trick. However, wood floors occasionally need greater maintenance which may include waxing, polishing, sanding, filling of scarred wood, and refinishing. Wood-look tile is the clear winner in this category! What about variety? Hardwood floors are available from many different species of trees and can be stained in a variety of shades. However, if your tastes lean towards more exotic wood, you may find yourself out of luck. Many trees species are expensive or even endangered from overuse. However, since the material in wood-look tile is scanned, it can be used again and again without depleting resources. Trees throughout the world would say that alone makes wood-look tile the overall winner! These are just a few ways in which wood-look tile wins over hardwood floors for your home. Come in to our store and take a look at the different types of wood-look tile you have to choose from. There is sure to be the perfect style for your taste.